A versatile artist as comfortable with printmaking as he was with drawing and painting, Fernand Toupin studied art at Montreal’s Mont-SaintLouisCollege and the École des beaux-arts until the early 1950s. In 1955, Toupin contributed to the Manifeste des plasticiens, a text that positioned the ideas of a group of abstractionists known as the Plasticiens, against the Automatiste art practiced by Paul-Émile Borduas, Jean-Paul Mousseau, Jean-Paul Riopelle, and others. Unlike the Automatistes, who celebrated accessing the subconscious through gesture, the Plasticiens aimed to remove individuality and subjectivity from art. Toupin, along with Louis Belzile, Jauran and Jean-Paul Jérôme, heralded the vision of an artist who was more architect than spontaneous creator. 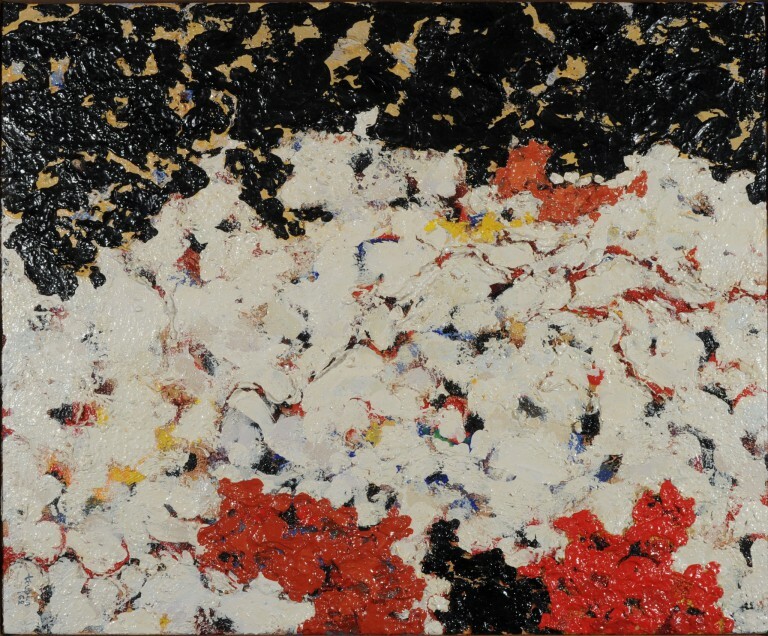 In the Plasticiens’ paintings (which are untitled and usually identifiable only by numbers), structure is paramount. Pure geometric form and the dynamic interplay of line and colour become aesthetic ideals. Heralding the two-dimensional grid works of Dutch painter Piet Mondrian (1872-1944), the Plasticiens presented an alternative direction for Quebec artists. By the 1960s, Toupin had moved away from the Plasticiens approach. Hard edges and smooth surfaces are absent, for instance, in Le Temple interdit (Forbidden Temple), which preserves visible brushwork and baffles geometry. For Toupin, this approach became a signature style until the early 1990s: for thirty-odd years, he experimented with texture and depth by mixing paint with marble dust and even small fragments of bark. However, Toupin would return to flat, geometrical patterns and black outlines for the remainder of the 1990s, even segmenting his works into smaller geometrical shapes as if broken from their source. Clearly, for Toupin, the impulse which had initially attracted him to the Plasticiens approach remained viable.